This CT imaging system enables Dr. Wilson to view your needs in a three-dimensional (3D) way. Previously, the benefits and technology of Computed Tomography (CT) were only available in a hospital setting and at the cost of thousands of dollars per image. Because Dr. Wilson is committed to cutting-edge technology that provides excellence in care, he is one of the few oral surgeons in the Phoenix, AZ valley to offer this superior imaging system into his practice. This CT imaging system enables Dr. Wilson to view your needs in a three-dimensional (3D) way. Its state-of-the-art technology will help him diagnose with an enhanced level of accuracy and provide treatment with unprecedented confidence. With the use of this 3D technology, Dr. Wilson is able to easily diagnosis disease processes early, plan surgical procedures that minimizes the risks of surgery, and optimize your oral and facial health. All of this is provided at a fraction of the cost and inconvenience afforded by hospital CT scanners. What’s more, with this new 3D imaging system, patients are exposed to significantly less radiation than when they receive a radiograph or x-ray. And the system’s open design is as comfortable and simple as having a traditional panoramic x-ray, but with superior results. Dr. Wilson can see your teeth and jaw with unprecedented detail. The system has an open design and the imaging is usually complete in just a few minutes. Your health and safety is our greatest concern. Dr. Wilson can perform a wider range of diagnoses with even greater accuracy and better quality results. 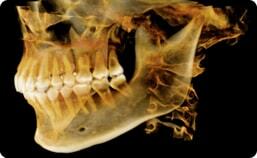 CT 3D imaging has become a valuable tool that enhances the results of facial skeletal surgery.